ActiveTrust® Suite delivers next level security by enabling you to proactively protect users from cyberattacks everywhere: on premises, while roaming and in remote office/branch offices. The solution automatically stops device communications with C&Cs/botnets and prevents DNS based data exfiltration. It collects curated threat intelligence data and distributes the verified data to existing security infrastructure to remediate threats and prevent future attacks. It is operationally easy to use, deploy, maintain and enables unified policy management. 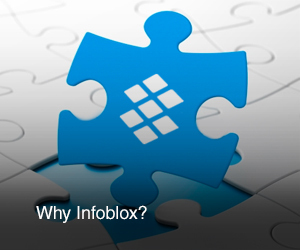 Infoblox ActiveTrust® allows customers to proactively detect, investigate, prioritize and prevent cyber threats. Infoblox ActiveTrust® bundles Infoblox DNS Firewall, Infoblox Threat Insight in the Cloud, Infoblox Threat Intelligence Data Exchange (TIDE) and Infoblox Dossier™. The solution prevents data exfiltration and malware C&C communications via DNS, centrally aggregates curated internal and external threat intelligence, distributes threat data to the customer’s existing security infrastructure and enables rapid investigation to identify context and prioritize threats. Infoblox ActiveTrust® Cloud, delivered as a service, prevents DNS based data exfiltration, stops device communications with C&Cs/botnets and provides visibility into compromised devices on or off premises. It is operationally easy to use, deploy, and maintain (no IT skills are required), and provides rapid time to value. ActiveTrust® Cloud bundles Infoblox DNS Firewall, Infoblox Threat intelligence, Infoblox Dossier™, Infoblox Threat Insight and Reporting.